Ideas make history. The religion of secularism, however, is based on the opposite proposition - that history makes ideas. The root of all struggle in the world today is between these two Propositions and their adherents. Muslims nowadays are the only ones who still hold to the supremacy of ideas. All other religious traditions have surrendered to the religion of secularism, which believes in the autonomous supremacy of history per se. The beliefs of secularism are held as firmly, indeed as fanatically, as any traditional religious beliefs. Marxism is the 'High Church' of secularism. This is not all. The difference between our ideas and their ideas is even more fundamental. We derive our ideas from a Revealed Paradigm; their ideas are entirely subject to their own changing whims, desires, emotions, cultures, interests, policies, strategies, theories and so on. We are subject to an objective controlling mechanism; they live in a free-for-all jungle. We are moral, they are both amoral and largely immoral. We are of course talking about the Islamic movement and the western civilization. it is necessary, therefore, that our view of the world should be totally different, indeed, opposite, to theirs. And it is. However, our view does not find expression; it is a view without a medium. The established media chooses to either ignore or ridicule our view of the world. This annual anthology and the 'fringe' Islamic media from which it is compiled are bearers of the worldview of Islam. This is not to say that every Muslim shares this worldview; quite the contrary. At present this world view is largely rejected by the ruling classes in all Muslim societies. This worldview would be found to be the worldview of the Muslim masses if only they could be reached. Only in Iran has this worldview become general and almost unanimously accepted by all its people. The rest of the Ummah outside Iran has become detached from its natural posture vis-a-vis the modern World. The ideas of Islam and the ideas of the Muslims are no longer making history. Truth has become a sub-culture surviving only because kufr found impossible to achieve its total annihilation, It is in the very nature of ideas destined to make history that they should challenge and defeat kufr in all its shapes and forms. This struggle is now attracting Muslims in large numbers in all parts of the world. The Islamic movement is slowly developing its own media. We are an integral part of the new mood in the Ummah. We now have an established global readership, albeit a small one. 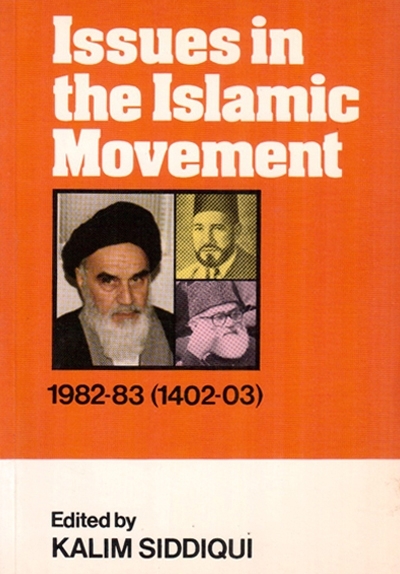 Nevertheless this book, and the Crescent International and Muslimedia from which it is largely compiled, are still virtually the only sources of regular, informed and authoritative commentary on world affairs from the point of view of Islam. The last article included in this book was written by me in December 1979. The production of the book in Toronto is supervised by Zafar Bangash, editor of the Crescent International. Sajjad Hyder has set the type on the Open Press's own new typesetting machine. The unrelenting efforts of a large number of dedicated men and women across the world have secured a worldwide readership for this book. My daughter Shama, now married, has once again read through the text. The errors that remain are all mine.